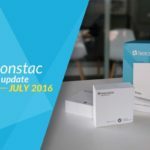 From directly embedding Google maps to markdown cards to being able to track your orders on the Beaconstac Store, there have been a lot of consumer-centric upgrades. There was no option to track your orders from the Beaconstac store earlier. Now, you can actively track all your orders from the store. Your completed orders (delivered, shipped or in-transit) will be visible to you along with your open orders and subscription charges. Completed Orders – You will see all your orders that have either been delivered, shipped or are in-transit. Open Orders – If your payment has failed or the order is preparing to ship, you will see it here. Subscription Charges – The subscription plan that you chose at the time of purchase will be visible here. 1. Login to the Beaconstac store with your username and password. 3. This will open up a new window, where you will see – Completed Orders, Open Orders, and Subscription Charges. Invoices had to be requested for and would be sent manually before this upgrade. Now you can easily download the invoices for both the hardware and the platform. 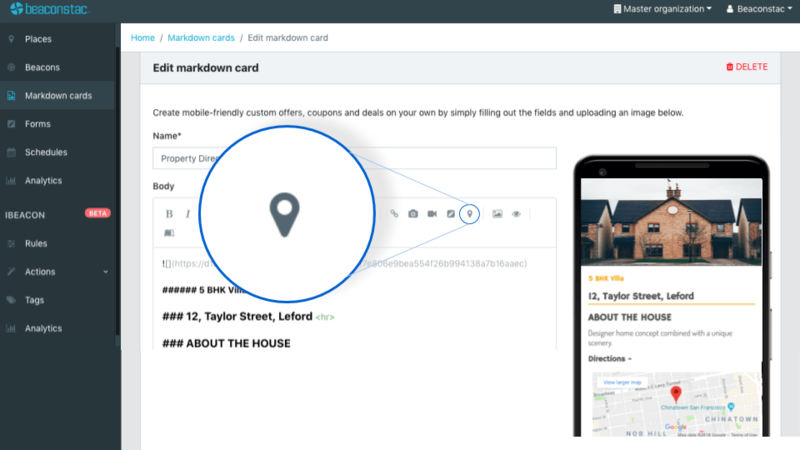 Adding a navigation option on the Markdown cards in the past meant adding a button that either said ‘Navigate’ or ‘Directions’ which had to be clicked by a user to start navigation on Google Maps. This way of adding directions was not as intuitive as it could be. In real estate or retail where ‘location’ is everything, it is important to perceive if the end-user is able to locate the store or open house easily. Adding this tidy feature effectively allows you to draw more customers to your place of business. 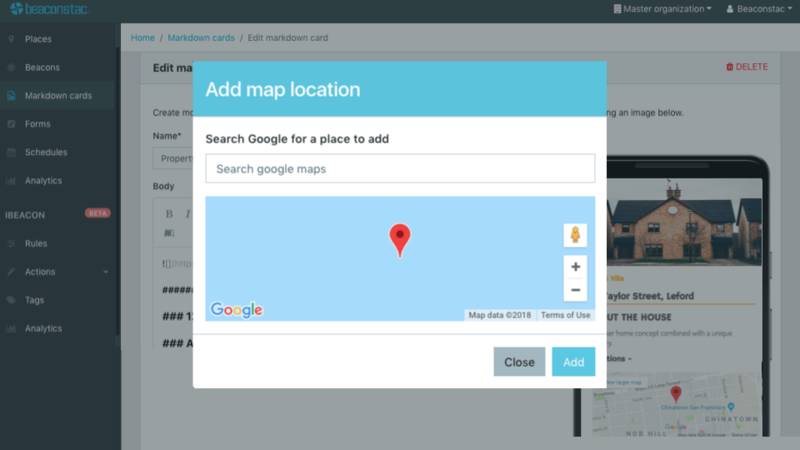 You can directly embed Google Maps onto your markdown card making for a far more intuitive campaign. Upon clicking the map, the Google Maps app will open up on the smartphone. 3. A pop-up ‘Add Map location’ will appear. 4. Search for your location on Google Maps and select the right one. 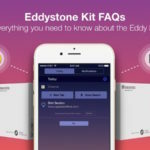 The background and the color of the text on buttons like ‘Buy now’ or ‘Navigate’ were preset based on the theme of a particular markdown card. To make the markdown card consistent with brand colors, our customers had to use CSS codes. However, we realized that – marketers like you and me – are not CSS experts! Now you can change the background color of the button and the color of the text to make it even more aesthetically pleasing and in line with the brand’s chosen colors. Choosing a theme but still being able to customize the colors of the button and text allows for more flexibility and experimentation. 4. Click on the ‘Background color’ and choose the one you like. 5. Choose your desired text color in the same way. To add a background or an image to the markdown card, you could either upload by dragging and dropping it or uploading it manually by searching for it on your computer. The issue arises when you want to use the same image in a different markdown card or if the image is not present on the computer being used. Uploading the same image over and over again is repetitive and a waste of time and efforts. Now you only have to upload an image once and it will be available to you in the image gallery. You can choose your previously uploaded image as a background for a different markdown card. 2. A pop-up ‘Set background’ will open. You can add a color, an image or gradient to the background. 2. A pop-up window ‘Select image’ will open. What updates would you like to see next? Let us know in the comments below. 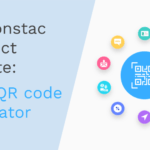 Get started with Beaconstac today. Schedule your demo and talk to an expert in proximity marketing right away.